Achieve your potential by transforming small moments into big outcomes. For bulk purchases (25+ more), please click here. Our lives turn on small moments of fearlessness that carry powerful consequences. Too often we are on the sidelines as they unfold. We’re not prepared because fear keeps us from acting, or it makes us act to preserve what we know, even if we don’t like or want the status quo. Or we’re not paying attention. There are 1,440 minutes in a day. This book is about recognizing those 1,440 moments in your life every day and preparing yourself to act with less fear and more intention. More authenticity. Especially if the life you want is not the one you are living right now. Fear is real, and it is powerful. But it doesn’t have to rule us. Here’s what I wholeheartedly believe when it comes to fear: by practicing acts of fearlessness in the small moments of daily life, we prepare ourselves for big outcomes. You’re likely reading this book because you want something more out of your life—either personally or professionally—and you sense that fear is holding you back. Perhaps you’re one of the many people I hear from each day, through one-on-one conversations, e-mails, and letters, who aren’t engaged in their work. Recent Gallup research has found that two out of every three workers do not feel involved with, engaged in, or committed to their work. You want to know right now how to tap more of your energy and potential—if you could get past the fear. You’re opento change, but you want specific, clear ways to achieve change that lasts. You want to better speak your truth and act upon it in the moment. So let’s do this, through learning to recognize the small moments to practice fearlessness. This is how you will get to the “more” in your life. 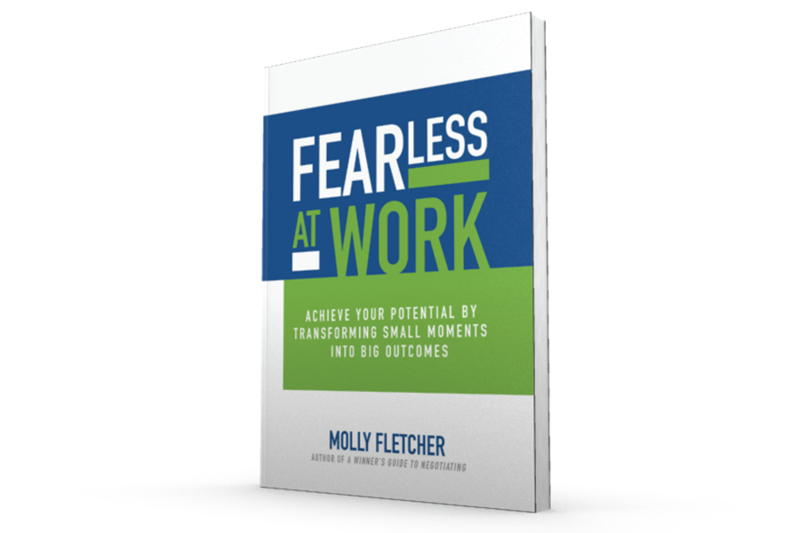 As a sports agent who reinvented myself as an entrepreneur, consultant, corporate speaker, and author, I intentionally studied and practiced fearlessness. For two decades, I represented elite athletes, coaches, and broadcasters whose success depended on peak performance. They had learned to navigate fear and create a culture where others did the same. Fear is there, too, believe me. The next time you read about a multimillion deal being inked, know that both sides pushed beyond fear (this might sound ridiculous, but for some, this is a small moment that can come, go, and never return). Fear paralyzes people, and the higher the stakes, the greater the fear. Fear usually enters the picture when a decision is within reach or a deadline is looming. There’s so much on the line that it’s easy for people to get anxious and defensive. So while I was observing my clients’ methods of being fearless peak performers, I had to be fearless on their behalf when I negotiated contracts and branding deals that totaled more than $500 million. I had to conquer fears as I negotiated appearances for Hall of Famers or a multi-million- dollar contract for pitcherJohn Smoltz, or multiple contracts for Cy Young winners, allstars, Hall of Famers, and Emmy Award–winning broadcasters. And I was usually the only woman in the room. That was another driver to becoming fearless. I could not be scared if I wanted to survive, much less thrive. Do you fear change? How about conflict? Maybe it’s more specific: an upcoming deadline, a job performance review, or a presentation? Maybe you are afraid to ask for help or to confront a colleague or share a new idea. Perhaps you fear the uncertainty of being able to perform in a crisis or to make the decision that is best for your team. You may fear demotion or losing your job, even if that’s unlikely to happen. Fear is like a virus that moves within corporate culture, infecting our ability to innovate and make progress as individuals and members of teams. Why do we stay in a job we aren’t engaged in? Because we are scared of change? Scared of the unknown? Why do we not allow ourselves to really dream? We default to labeling as a way to control people and outcomes. In general, we avoid challenges, give up easily, see effort as worthless, ignore constructive criticism, and breed the insecurity that leads to feeling threatened by others’ success. The fear-infused, fixed mindset says, “You either have it or you don’t,” and if you don’t, don’t bother trying. Fear is fueled by expectations. Expectations that we will perform to a certain level. Expectations that talent will carry us. That it should carry us. This sense of entitlement masks fearand creates limits. This mindset pigeonholes a person by what he or she is good at, and only by that. The expectations from the outside—the status quo—determine what a person can and should do. The status quo helps us feel like we are doing the right thing without figuring it out for ourselves. Fear blocks growth, period. Fear can grow in the gap between where we are and where we want to be. It’s like looking across a canyon to a beautiful resort. All you can see is the dropoff and no way to get there. Fear creates a world we don’t love, with triggers that serve to keep us trapped. Fear keeps us from realizing that there can be more. More energy, more contentment, more joy. Fearlessness is the way to get across that gap, a bridge to the lives we want to have. And the good news is that we can cross that canyon. It is possible to move from a fixed mindset to a growth mindset. Personally, I don’t think success, or the best version of ourselves,is as likely without a direct look at the fears that hold us back. If you are one of the majority who fear a tough conversation or hammering out deal points, for example, how empowering would it be to turn your fear into confidence? Fearlessness is learned through a growth mindset. A person with this way of thinking views others’ success as a window into lessons and inspiration for even greater personal success, fueled by the power of free will (not expectation). So fearlessness is a process, not a single passage. It is achieved breath by breath. It’s not a question of moving fast or far or perfectly. It is about having the ability to look at your fears squarely, learn to stay there, and find your inner resources that will help you move around fears. Fearlessness is about keeping going. Notice that fear is a noun and a verb. It is active and solid. I believe that it can be made into something else. By practicing in the small moments. People who achieve big outcomes often do so one tiny step at a time. For instance, an Everest climber takes one step at a time, and it’s not a direct journey to 29,000 feet. Above 18,000 feet, the body begins to break down, so climbers must make a series of up and down treks to acclimate, eat, hydrate, sleep, and regain strength.5 On the world’s highest peaks, paying attention to the present moment is key to survival. Here’s a more down-to-earth example from my own life. My first job in Atlanta was with the Super Bowl Host Committee, the centralized planning entity that managed hundreds of daily requests and inquiries in the year leading up to the big game. I was part of a small team that worked in a big building downtown with no windows, which gives you an idea of my outlook. On days when I was particularly down, especially during short winter days that made me feel like I would never see sunshine again, I would call my parents, crying. Dad would try either to get me to quit and come home to Michigan or tell me about all the jerks he had worked for over the years. Somehow I managed to drag myself back to work the next day. I particularly hated when VIPs showed up and wasted their time waiting for the supervisor to greet them. I felt like it was my fault they were waiting, and I feared the backlash from them (that I was incompetent for keeping them waiting and not getting them access sooner) and my supervisor (that I was worthless no matter what I did or how hard I tried). Then I took a hard look at my reality. I asked myself what I was truly afraid of, given that this job would end after the Super Bowl. As I saw more clearly how my fears were ruling me, that reality check opened my eyes to the little opportunities presented by my supervisor’s power plays. I could make small talk with the NFL commissioner and other VIPs while they were waiting, either in person or on the phone. Just as important, I was practicing how to conduct business with people who were often annoyed or even hostile. These opportunities gave me momentum. I developed a help-me-or-hire-me goal and attitude. I connected with everyone, anticipating that they could make a difference in my career, and one day, I might help them as well. After the Super Bowl, I had a sizable list of VIPs I could turn to for advice, and those contacts led me to my career as a sports agent. Complex tasks often evoke fear, and to counter that, we need a clear way to focus on what is most important in the moment. “Simple can be harder than complex; you have to work hard to get your thinking clean to make it simple,” Apple cofounder Steve Jobs said. In so many ways, we do better when we break down a big goal into smaller bits. For example, investors stay steady and make better decisions about the market (they don’t hold on to losing stocks too long, and they don’t sell rising stocks too early) when they view small gains as separate events instead of a cumulative performance. Thinking in small steps helps us think more rationally and less emotionally. It helps us find meaning too. If you have ever lost a friend or family member suddenly, you know that feeling of appreciation for every day and minute. We understand that we have only the present moment of life, and everything else is either a memory or a plan. "When nothing seems to help, I go look at a stonecutter hammering away at his rock, perhaps a hundred times without as much as a crack showing in it. Yet at the hundred and first blow, it will split in two, and I know it was not that blow that did it, but all that had gone before." These words helped the Spurs find meaning in the daily grind—the workouts, the long season, the injuries, and the constant demands on their physical health, families, and time. Every day they were each striking a blow for their common goal. The Riis quote also helped create a sense of anticipation: What blow will crack the rock? Will I be ready to step up and deliver? Suspense is part of play. Inspiration keeps drudgery away. When we practice fearlessness, we also protect the sense of joy and fun we experience doing what we love, so our own unique passions never become a grind. This book will help you pay attention to small opportunities to practice your values, help others, maybe take a risk to create a new ritual that will push you toward your purpose. Thinking small can lead to taking small steps in a new direction. All those steps make up a journey to big moments—and your highest performance. It’s up to you to identify these small moments and seize their potential, especially if you want to make big moves. This is the easiest, most consistent way to become fearless. I recognize the fear of change, especially the big push that is needed to go from good to great. In 2007, I was representing an all-star stable of professional athletes, coaches, and broadcasters. I was earning a healthy six-figure salary and raising three daughters. It was all that I thought I wanted, including the approval of others. Who would walk away from that? I did. I felt a purpose calling me for something greater in my life, even if it meant there was no guarantee of success. I knew I could help more people, and my personal and family life could have better balance. As my children grew, I was reminded of how short life is. The part of me that feared risk and change began to pivot: What if I don’t pursue my greater purpose? It was easy for others to miss the fact that I was changing my life to achieve more control of my time and schedule, more balance, more impact. Many who knew me only superficially wondered: What is she doing giving up a dream job to go out on her own? I could see the confusion in the faces of my celebrity clients and fellow sports agents. They were counting on my attention 24/7, and I had spent years giving it to them. The answer to that dilemma was my obsession with human performance. As a kid, the idea of success had always captivated me. What separated winners, especially in my sport of tennis? How much was sheer talent, and how much was mental preparation? I watched my mother excel at volunteer leadership in our community and speak effortlessly to large groups and motivate them to take action. I saw myself in a role like hers, leading and inspiring others. When I became a high school senior, my high school rejected me as commencement speaker, but that didn’t dampen my dream. It revived when I became a sports agent and watched my athletes and coaches get paid handsomely for corporate speeches. I began to imagine what I would say to big audiences to help them succeed and to visualize this work allowing me more time with my family. Would fear of leaving the familiar, and possibly failing, keep me in the familiar? What if my message wouldn’t resonate? What if I couldn’t make a living from speaking and consulting? What if those fears came true? It was my turn to say no to fear and yes to fearlessness. It was time to act fearlessly. From the field of sports representation, I reinvented myself as my own boss, in another world where fear is a deal breaker: public speaking. Speaking in front of others is one of the most common fears in our society, but what I learned about fearless peak performance in sports helps me every time I step on a stage. Companies trust that my message is worth the time of the hundreds or thousands of people in the audience. In that arena, there’s no room for fear as I speak to inspire fearlessness in others. No is a word very familiar to all of us who work in high pressure environments, who feel that there’s something missing, who long for more, who feel the clock ticking. I write this with the fervent hope that you will gain inspiration and instruction about how to speak up compassionately and take action in the small moments. Fear can’t be eliminated, but we can work through it. You achieve this by creating awareness of key moments and learning to trade a current behavior for a better one that builds fearlessness. In this book, I identify dozens of ways you can exchange a fear-based habit for a fearless one. These trades are small but significant changes to your thinking and actions. Over time, they create a big impact. They will strengthen the positive habits and root out the toxic patterns. Your fear will be replaced by confidence. “Fearless Fundamentals” (Chapter 1) are five habits that influence all the rest. If you have time to read and apply only these trades, you will be on your way to greater fearlessness. “Anchoring Your Values” (Chapter 2) will knit your new actions to your deepest beliefs. These five trades are key to identifying small moments in which your authentic self learns to shine without fear. “Maximizing Your Focus” (Chapter 3) in the small moments through these five trades helps you practice the concentration and attention of an elite performer, so that fearlessness becomes an automatic function. “Stretching Critical Moments” (Chapter 4) decodes how top performers embrace fear at critical turning points to achieve remarkable feats. They bend time with these four trades, and you can too. “Redirecting Persistent Behaviors” (Chapter 5) enables you to identify and adapt recurrent habits that you may not even know are working against you to keep you fearful. Change old habits with strong intention. Five trades total. “Reframing Bad News” (Chapter 6) helps you be prepared for when things go wrong. With these five trades, you will fearlessly embrace and make the most of small moments that you might otherwise miss. “Shifting Toxic Thinking” (Chapter 7) are five trades that will help you recognize and weed out persistent fearbased thoughts and plant rituals that will drive your best outcomes. “Reprogramming Your Default Settings” (Chapter 8) examines patterns of thoughts and actions that are so natural, you may not even think of them as fearbased. These five trades represent a reboot for greater fearlessness. “Reinventing Your Perspective” (Chapter 9) offers five trades to create a formidable new lens of clarity and put the blinders on fear. “Unifying Your Tribe” (Chapter 10) are three trades that will help you lead fearlessly within your work team, family, or any group—one small moment at a time. These tools will benefit you by creating awareness and fostering courage to live fearlessly. Through personal anecdotes that are easy to grasp, you will find concrete ways to develop new rituals. Purpose is the rocket programmed to reach your unique destination. Fearlessness is the fuel. My purpose helped me understand that I needed to leave my work as a sports agent, in part because my success depended on someone else’s behavior. That was not enough for me. My purpose helped me see where I needed to go, what fears stood in my way, and the trades I would need to make to think and act fearlessly. My purpose strengthened my relationships. If there is one regret from my sports agent days, it is that I did not work more with my clients on their own mission statements. If you don’t have a clear purpose, you are more likely to sacrifice your time, energy, and resources to the desires of others and to stay in a place of passivity and fear. I can’t say enough about how hard this is, how much commitment it takes, and how satisfying it is to embrace and follow your unique purpose— not to mention how much of an edge it gives you over your competitors who don’t want to or can’t do this rigorous work. A strong mission statement that captures your passion and individuality will become an important lens through which to view everything. You will use it to clearly identify the small opportunities to change your behavior and trade for fearlessness.You will be free to say no when everyone around you thinks yo should say yes. You will have the vision to surround yourself with a tribe who supports your fearless pursuit of your purpose. 2. Embrace vulnerability. The greatest change happens when we surrender completely. This requires being vulnerable. It takes a great deal of strength to say that your previous way of doing things isn’t working anymore. You cannot do this by yourself. When I visualize vulnerability, I think of the reality show Dancing with the Stars. Celebrities compete with professional ballroom dancers, and under harsh spotlights, their every move is critiqued by judges and fans. They are vulnerable, knowing that they can’t do it alone. They depend on their partners to make them look good or at least to keep them from embarrassing themselves. They accept the exposure as a way of showing a different side of themselves. Often they are in the middle of reinventing themselves, and they use the show as a way to tell their new story—that they are more than a former pro athlete, for instance. They aren’t afraid to look foolish. They aren’t afraid to fail. An attitude of vulnerability is integral to fearlessness. You demonstrate vulnerability by letting go of perfection and the illusion of power. For many of us, that may involve acknowledging a higher power. Whatever your view of the world, vulnerability will help equip you with new rituals for a life of fearlessness. You achieve a fearless mindset when you trade your typical reactions and habits for new ways of thinking and acting that position you for your greatest success and fulfillment. This book comes with a promise: by adopting these small changes, over time, you will begin to see your life change. You will be more aware and motivated. You will make better decisions aligned with your true values. Tough conversations will become easier and even welcome. You will unleash your best energy. One moment at a time, you will become fearless.